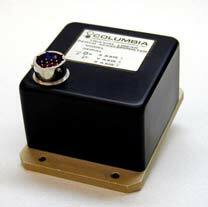 Columbia Models SA-207LN and SA-307LN Servo Accelerometers are highsensitivity, low noise sensors designed for use in seismic and low level, low frequency motion studies. The accelerometers are self-contained and provide high level, low impedance output. No signal conditioning is required in most applications. Like the single-axis SA-107LN, these multi-axis sensors allow measurements in the low frequency micro-G range. Aside from the traditional DC-coupled zero output, the SA-207LN and SA-307LN Accelerometers provide AC-coupled zero output which eliminates tilt-induced or offset errors facilitating high amplification of the basic output. Consult the factory for customized versions of this sensor. +0.01% / Deg C Max.